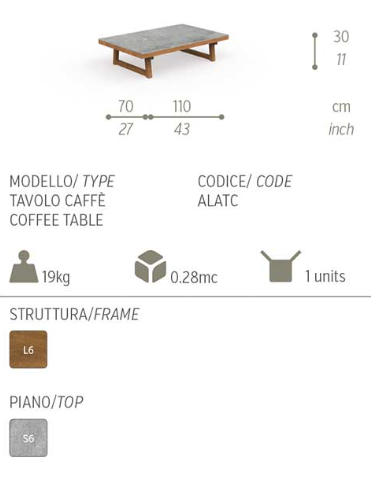 Alabama Outdoor Coffee Table By Talenti - Iroko Wood And Concrete and the finest artistry are brought together in the creation of Alabama collection, the combined endeavour of an exceptional, handmade production in Italy. Also available separately is Alabama armchair, with Iroko wood frame and outdoor textile fabric covering outdoor foam. Coffee table measures 1.1m long x .7m wide, x .3m high, with 8mm cement top (S6). Cushions/fabric : vacuum off dust if dirty. Then spot clean any marks with a cloth and soapy water. For stubborn stains we recommend using Sunbrella Fabric Cleaner.